Carleton Place & District Memorial Hospital (CPDMH) opened in 1955 to serve the residents of Carleton Place and surrounding communities. Like other communities in Canada, this region lost native sons in World War I and II; loss of life which represented enormous sacrifice by the community’s young and brave. The community responded by planning a hospital as a memorial to these men and women. Ten years of planning started right after the war, including a sod-turning by the Honorable George Doucett, Minister of Highways for Ontario in April 1953. 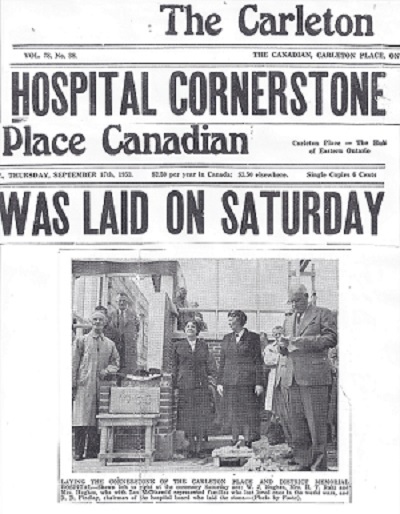 On February 12, 1955, the Honorable Paul Martin, Minister of National Health and Welfare for Canada, officially declared the hospital open to serve the community. Donations and government grants covered the $304,000 cost to build the 36-bed hospital. The first Board Chair was D. Douglas Findlay and the first administrator was Miss Cora Droppo. Like the community, the hospital expanded over the years. With every renovation and redevelopment, the community has played an active role in supporting the hospital. In 1967, a second floor was added. In 1982, the emergency and clinic areas were renovated and a new physiotherapy department was added. Today the hospital has redevelopment plans before the Ministry of Health to meet the needs of today and the future. The commitment of local communities remains vital to delivering quality service close to where people call home – where there is comfort, support from family and friends, trusted medical expertise and an environment that encourages recovery and rehabilitation.